Can I call Ecuador a Third World Country? I looked it up, and by one definition apparently I can. Though living in the city we have enough modern conveniences that it hardly feels accurate. “Second World” seems more appropriate since it feels somewhere in between first and third world conditions. I now know that’s not what second world really means but, hey, that’s what it feels like! One of my closest friends recently wrote a blog post that got me thinking about my own first world problems in the midst of a third world country. They’re definitely different from the problems we faced in the U.S., but in some ways maybe they’re not that different. 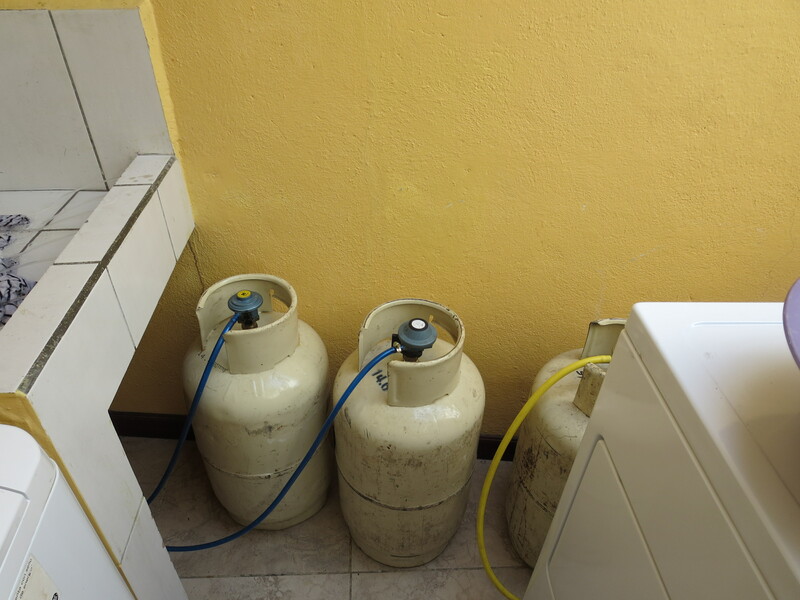 Meet our gigantic gas tanks that run our dryer, hot water, and stove. (Ok, maybe they’re not that huge, but they’re at least twice the size of the ones I’m used to. And compared to everything else here in Ecuador, they feel really big. See my previous post for more on that). Gone are the days of gas being piped into our house from some mysterious, unseen, central location at exorbitant cost! Our tanks seem to last about a month, but I haven’t really figured out how to predict when they’ll run out. 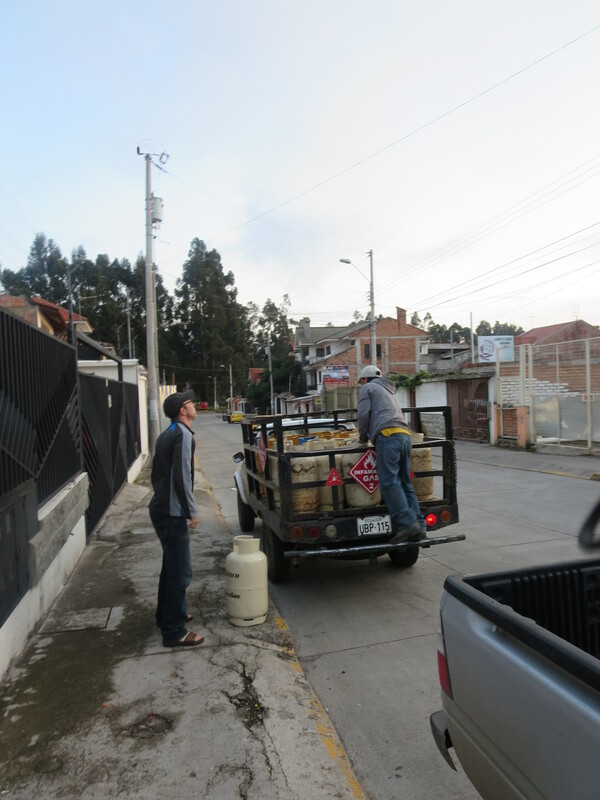 Every Friday morning around 6:30 in the morning a truck comes by. He drives up and down the streets honking his special “I’m the gas truck” series of honks. If you need a new tank of gas, you run outside, flag down the truck, drag your tank out to the road and, for $2.50, the driver will exchange your tank. Next, meet our family car. Wait…we don’t have a family car anymore. Here, the bus is your friend, but it’s a friend that requires you to put forth some effort. First figure out where you want to go using this handy bus guide (which isn’t completely accurate, so you’ll have to extend some lenience to your new friend). 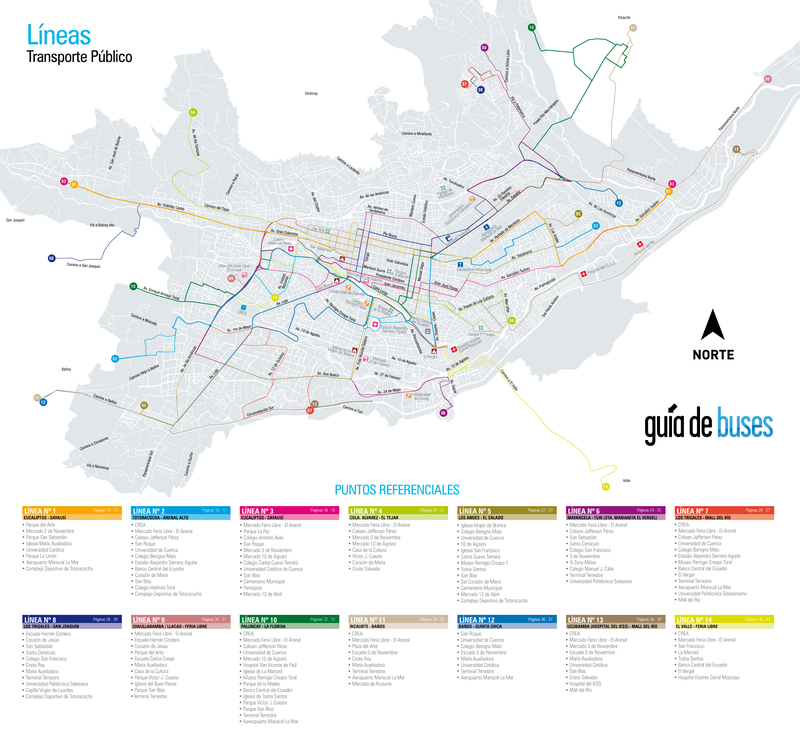 Now, walk along one of the streets you identified as being on the bus route until you find a Parada de Bus sign. Then watch closely for the right bus. Often multiple bus lines travel down the same street, so you have to look for the little sign in the front window identifying which line it is. Once you see the one you want, hold up your arm to flag it down. Usually this will result in the bus stopping to pick you up, but not always. So don’t be offended if it just drives on by. Not to worry, another one will be along in 5 minutes, or 30 minutes, or an hour…This new friend will keep you guessing! Once the bus pulls over, simply hop on the bus and pay your 25¢. Now is when the fun really begins! Each bus and driver have their own personality. Some drive extremely fast, careening around cars and corners at breakneck speed. When we end up on one of these buses we do a lot of what my kids have termed “bus surfing.” If you’re standing, be sure you’re holding onto something. I’ve found it works best facing the windows, one foot to the front of the bus and one to the back. This allows you to shift back and forth in a fairly natural way (hence the term “surfing”). Others drive so slow that I’m certain I could walk to my destination just as quickly. Though the turtle buses definitely provide an easier ride, I think I prefer the speedy buses. Finally, you just have to figure out where to get off! All of the buses have a little scrolling sign that tells you the current bus stop and the next bus stop. There’s even a recorded voice that announces these stops. Sometimes, however, the driver turns the voice off (I’m sure it must get annoying – or it’s just broken), and at times the scrolling sign is off too. Once you know the route, that’s not much of a problem, but if you’re riding the bus for the first time it can be a bit anxiety inducing. Once you’ve identified your stop, move to the back of the bus, press the PARE button, and leave through the back doors. That’s it! Even in a third world country, thankfully our daily inconveniences are just that. Inconvenient. But in the end, not that big of a deal. I can’t really complain when I only have to pay $2.50 for enough gas to cook for an entire month. Depending on the bus certainly makes life interesting. It’s difficult to predict when you’ll arrive somewhere when you’re not sure when (or if) a bus will come along, and when the ride sometimes takes 15 minutes and other times 35. 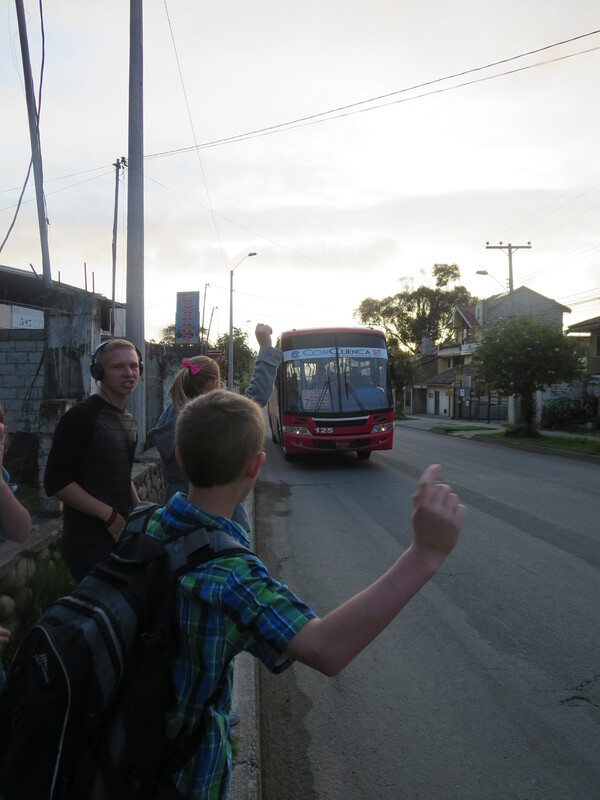 But it’s cheap and gets us where we need to go, and sometimes we even get in a little bus surfing along the way. Unfortunately, true “third world” problems exist both here and in the U.S. Poverty, hunger, crime, disease can be found most everywhere. I’ve been reminded, once again, to count my blessings and be grateful for the good around me rather than focusing on the sometimes uncomfortable, but ultimately insignificant inconveniences. Sounds just like Portugal! Ahhh the memories.